Ayurveda Herbs - Some ayurveda herbs are cultivated in many homes. Ayurveda is gaining popularity not only all over India, but throughout the globe also. Ayurvedic treatments have proved beneficial in healing many illnesses. Some are spices used for cooking as well as for health benefits. Many sickness can be controlled and even prevented with the uses of some ayurvedic herbs. These can be easily made available at home, and they are used as home remedies. In India, especially in Kerala, many people depend on ayurveda herbs and medicines for their daily life. Indian gooseberry, also known as Amla in India, has several health benefits. Read more about amla by clicking the above link. 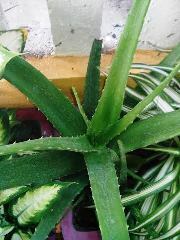 Aloe Vera is a herbal plant with highly medicinal benefits, especially for the skin. Check it out to know its various health benefits. Clitoria ternatea (Shankhpushpi) is a creeper plant grown in India. It is an important herb in Ayurveda, used for several ayurvedic medicines. . Dates comes with great medicinal values. Fenugreek - Fenugreek is used in every day in our kitchen, many without knowing its wonderful health benefits. Find out the amazing benefits by clicking the above link. Flax seeds - To learn the abundant benefits of flax seeds, click the above link. Tulsi - The holy plant of India has several health benefits and thus it is worshipped in India. Turmeric - This bright golden color spice has several uses. Breadfruit (Kadachakka) Benefits - Kadachakka (Breadfruit) is a delicious vegetable with nutritional value. It is high in energy from carbohydrates, low in fat, It is gluten free, dense with protein, and rich in vitamin B and fiber. Breadfruit contains roughly 25% carbohydrates and 70% water. In 100 grams of Breadfruit contains 103 Calories. To know more about it, click the above link. Pumpkin Health Benefits - The humble pumpkin has several health benefits which are not known to many. A cup of cooked pumpkin contains more than 200 percent of your recommended daily intake of vitamin A. To know more about it, click the above link. Eucalyptus Tree - Health Benefits - Eucalyptus is Anti-inflammatory, Anti-bacterial, Anti-fungus, Anti-infectious, Analgesic, Expectorant, Insecticidal and Aeromatic. To know more about it, click the above link. Oxalis Corniculata(Puliyarila) Oxalis Corniculata is a small creeper usually grown in moist climate in gardens. The flowers are yellow in color and the fruits are cylindrical in shape. The herb has several health benefits. To know more about it, click the above link. ﻿Ginger Health Benefits﻿ - Ginger is a regular ingredients used in Indian cuisine for centuries because of its various health benefits. It is also used in some Asian cuisine. Ginger is also one of the top 10 culinary herbs and an essential herb in Ayurveda. Ginger is used in various forms such as fresh, dried, powdered, or as an oil or juice, and cosmetics. To know more about it, click the above link. Durian - This spiky fruit has many health benefits. More number of herbs will be added to this list.